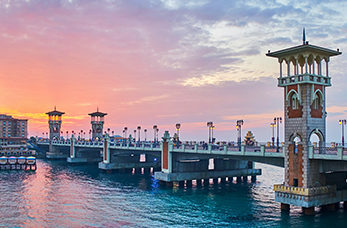 Known as "The Pearl of the Mediterranean" Alexandria is the second largest city in Egypt and was founded by Alexander the Great in 332 B.C. Today it offers fascinating insights into it's Greek past, as well as interesting mosques. The fort was built in the 1480's on the site of Alexandria's ancient lighthouse, one of the seven wonders of the world. Located inside the fort is the Naval Museum containing artefacts from the Roman and Napoleonic sea battle. One of the most important monuments in Alexandria, the Roman Amphitheatre is the only one of its type found in Egypt. The biggest memorial column in Egypt, Pompey's Pillar is made from Aswan rose granite, its total height is about 28 metre's. Visit the Greco-Roman Museum where you will find displays of ancient times honouring the Greek and Roman heritage.